You are not logged in. [Log In] ETS Forums » Forums » The Survival Forum » The Survival Forum » I need tour ideas of the perfect flashlight! #279301 - 02/02/16 04:04 AM I need tour ideas of the perfect flashlight! Short and sweet, describe all of the features your ideal flashlight would have. I understand this topic was discussed a while back and do not wish to revive an old thread, as I have taken notes from it and using what I can. With technology becoming more and more advanced, I will see what is possible. AAA-powered, LED (duh), waterproof, and with a ring of glow in the dark material around its reflector so you can find it in the dark when its shut off. Its one downside: The little tether to connect it to keys has broken, and I can't find a replacement for that part. Hi, Sybert! Long time no see! Well, the ideal light is going to be subjective. Do you mean an EDC light? A light for camping? Different lights will be better suited to different purposes. But there are some generalities, at least for me. First off, it has to be LED. That may go without saying in this day and age, circa 2016, but I have no use for incans anymore. Next, my strong preference is for CR123a batteries. I'll concede that AAA/AA are useful for some applications; I often carry a Streamlight MicroStream AAA with a lithium cell in it as a backup to my regular EDC light. And AAA is great for keychain lights to keep the size down. But for my go-to light I absolutely require the use of CR123a cells! I strongly prefer lights with simple UI's and just a couple of modes. For 95% of what I use a light for just a HIGH and LOW will suffice. A low mode is sufficient for getting my keys in the door, looking around under the seat, checking the mailbox, etc. Depending on the output of the light LOW is often enough for most tasks. But I like to have a HIGH mode for camping, navigating parking lots, urban use, "tactical" use, etc. The UI (User Interface) if critical IMO. I want the button to do just one thing, turn the light ON and OFF. The HIGH and LOW modes should be accessed by twisting or rotating either the bezel or head. Elzetta calls this "uncoupled binary controls" and it's my ideal UI. My second choice- and let me add, not a close second- is one button that toggles between HIGH and LOW. This is suboptimal IMO but I can live with it as long as the light defaults to/comes on in HIGH. Two CR123A cells is my preferred for factor for most uses. A singe CR123A can be nice for EDC. My favorite lights right now are my Elzetta Alpha and Elzetta Bravo's. Usually I'm carrying the Bravo lately. I have two of them, one with an AVS head and one with a Malkoff M61N dropin. Ok, I'll be the first odd duck. 500 Lumen Max, 50 lumen low. Push button selector. NO FLASH MODE! Ergonomic grip, something like Count Dooku's light saber form factor. Three point type retention strap with breakaway buckle. Glass breaker point embedded on the button end of the case, offset from center, under the palm to also aid in grip retention. That'd be a good start anyways. I'm still EDCing (for like 10 years) the discontinued Photon Rex on my keychain http://www.photonlight.com/discontinued-products/photon-rex-li-ion-rechargeable-led-flashlight/ the primary woner of it is that it helps me to fully utilize every alkaline battery depleted below any other device voltage requirement. This little vampire can feed on any 1.2 - 3V type battery or accumulator, sucking it to a zero. Also I have a coin sized powerfull neodymium magnet glued to its back, so I can attach it to many steel points I have integrated into my clothing over the time, or use it as a simple compass on a string. The ingenious tiny magnetic charger is riding on the same split ring (picture is not mine). My favorite EDC light is no longer made, but an updated version of the Nitecore D10/D11 would be nice. When it was new, it had all the features that I wanted. It used a single AA batteries, had multiple output settings with a maximum output of 120L. They were well built and simple to use. If they made a new version with a higher output I would be the first in line to purchase one. 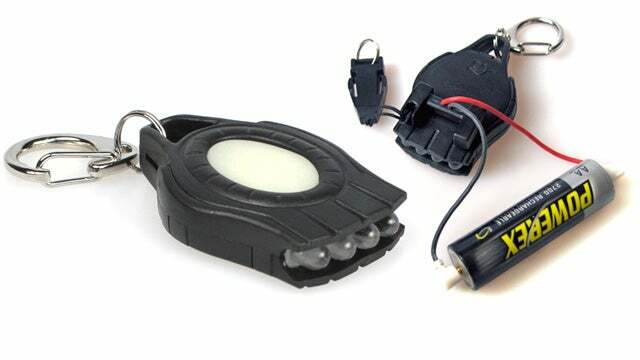 For a pocket/EDC light I would want one that runs on a single AA or CR123 battery, has a maximum output of 500L with scaleable output settings that are programmable and include strobe and signal options. Primary operation would be from a tail-cap switch. Currently, I am using an EagleTac D25C with is pretty close to what I am want but the search for the perfect EDC, for the modern version of Nitecore's D10 is still on. For a larger flashlight, there are a couple out there right now that fit my needs. Maximum output around 1000L, will run on either CR123 disposable or 18650 rechargeable batteries. This light would also have scaleable output with signal and strobe options that are programmable. The ideal light would be able to charge the 18650 batteries in the light by USB. This light would also primarily function by use of a tail-cap switch. Nitecore's MH12 is a pretty good representative of these features missing the user programmability. A secondary LED in green (preferably) or red would be a nice addition as well. Both of these lights need to be durable enough to survive a drop and water resistant enough to withstand rain and a drop in water up to a couple of meters in depth. At maximum output, runtime should be over an hour with much longer runtime at lower output settings. I like to have a beam with some reach, but being able to fill a room with light or illuminate a large are outside is more important to me. why? 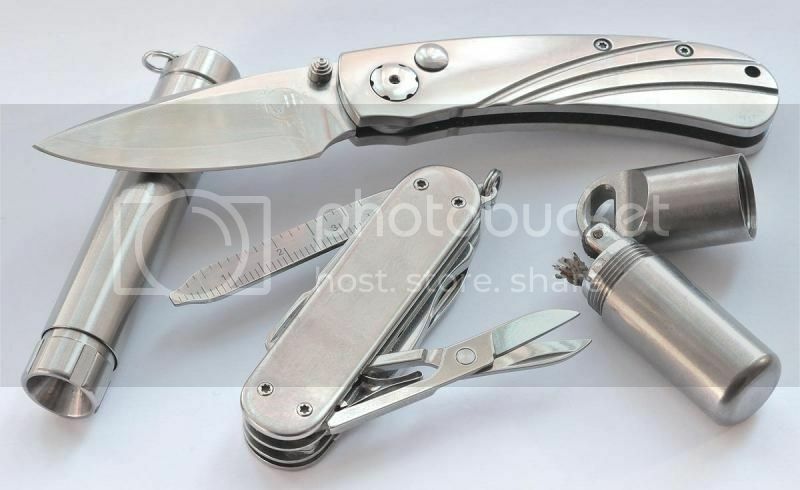 its small, light weight, ultra reliable, always on me, extremely long running, uses easy to find batteries, simple to operate. its wasn't cheap but the best things never are. so, i have little use for: unreliable units, ultra-bright, short-runtime, specialized-dangerous-high-voltage-rechargeable-batteries, lights i don't always carry, lots of fancy modes like strobe, any additional buttons/contacts that may corrode, or lowest-bidder construction quality. while the mako is hard to come by, there are others much like it that are readily available. Single AA alkaline that can also take NiMH rechargeables and 14500 LiIon rechargeables. Ability to turn off instantly, without having to cycle through different brightness modes along the way (single click from ON). Ability to turn on instantly to last brightness setting (single click from OFF). Cycle brightness modes (push and hold from ON to do a circular cycle through modes, release on chosen mode). All those blink, flash, strobe, SOS modes ... keep these oddball modes "hidden" from normal day-to-day operation (double-click and hold from ON to cycle through these). Regulated, for constant light output to the 95% exhausted battery point, then low-lumen unregulated for a few minutes so you can still find a replacement battery. One hand operation (that means pushbutton(s), and no twist head). Loosening the head should be reserved for deactivating the light so it doesn't accidentally get turned on, not for changing modes. Waterproof to a few feet of submersion. Wide smooth beam. No central hotspot for distance. Only three brightness modes needed - low, medium and high. Maybe four, if you include a super-low 0.5 lumen mode. Alternative: push and hold for continuous increase in brightness until highest. Release, then push and hold again for continuous decrease in brightness until lowest. Release, push and hold again to increase brightness. Repeat as needed. Some kind of removable/interchangeable screw-on adapter thingy that would allow keychain/lanyard hole, magnet, pocket clip, striker (to break glass or for self defense), etc. The closest thing to the above that I have run into, and is what I currently carry, is an "XTAR WK41". If anybody has other suggestions for something that meets most of the above criteria, I'd love to hear! I have bought, occasionally carried, but eventually abandoned the "4Sevens Quark AA" and the "Olight T15".